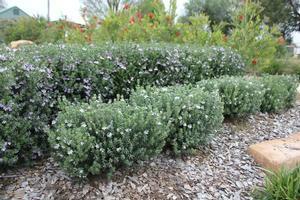 Grey Box™ coast rosemary is a small evergreen shrub with a dense rounded growth habit. 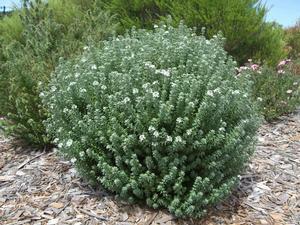 It has narrow gray-green foliage and small white flowers almost year-round. Growing to around 2-3' tall and wide, it's a true dwarf selection that has a natural “Box” shape. It's perfect for a hedge or group planting in pocket gardens and home gardens, yet tough enough for commercial applications as well. The only downside to this shrub is its accurate, but rather unimaginative, name! Grey Box has a particularly dense, compact growth habit. It forms a tight mound of attractive, narrow gray-green foliage that rarely needs pruning unless you're using it as a formal low-growing hedge. White, quarter-sized flowers appear in small clusters along the stems from late winter to summer and sporadically throughout the rest of the year. You can plant Grey Box coast rosemary in full sun or light shade. Grey Box is tolerant of most soil types including clay. Just make sure it's not planted in a location that's likely to be completely waterlogged for days on end in the winter. Once established, Grey Box should survive without any summer irrigation in coastal areas. Propagate Grey Box by semi-ripe stem cuttings. As the plant is patented, you can't propagate it for commercial gain though. Grey box coast rosemary doesn't need any maintenance other than, perhaps, an occasional light pruning to maintain its very dense and compact growth habit.